Welcome to the 2018 - 2019 Jr Crusader Boys' Basketball Registration Session. To BECOME a MEMBER, create a login and password at the top left. You will need to confirm your login. Once you have received an automated email from the Sport Engine account set-up, please confirm and you can begin player registration. If you already have an existing Sport Engine login, you can use that to begin the registration process. This registration will allow you to provide contact information, sign consents and submit payment. Please read through each page carefully to ensure that all information is provided accurately. To complete registration through our secure site, please have your Visa, MasterCard, Discover, or checking account information available. Registration fees must be completely paid before a player will be considered fully registered. The registration fee for the 2018-2019 season is $375.00. Your full payment will be due on or before the evaluation and placement dates. August 27 - 30, 2018. NOW: Registration for 4th, 5th, 6th, 7th, and 8th grade boys. August 27, 28, & 30, 2018: Player evaluation and placement at Catholic Memorial. 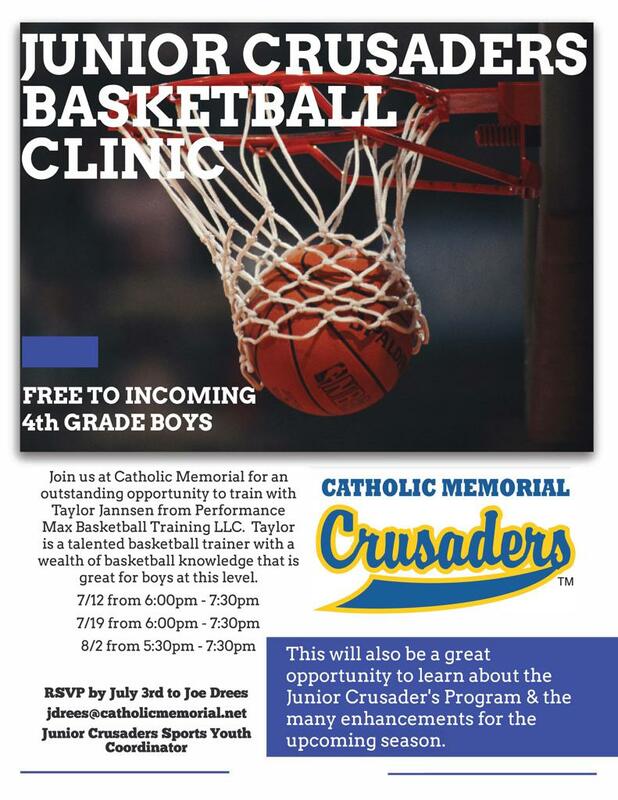 5th 7 6th grades: September 9 2018: Player evaluation and placement at Catholic Memorial. October 29, 2018: First week of practices. ©2019 Jr. Crusaders / SportsEngine. All Rights Reserved.